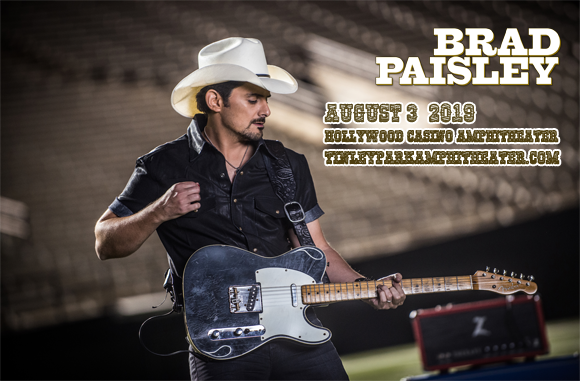 Country superstar Brad Paisley brings his all-new tour to Hollywood Casino Ampitheatre on Saturday 3rd August 2019! The "Bucked Off" singer always delivers an impeccable live show, and this year he's gonna work the crowd like never before with brand new material, larger-than-life stage production and good vibes all round! With any Brad Paisley concert, you know you're seeing a professional at work! Grab your tickets now! American country artist Brad Paisley signed his first music contract with EMI Publishing just one week after graduating from Belmont University in 1995. For four years he worked as a writer for other artists, before signing with Arista Nashville as a solo artist in 1999. He released Who Needs Pictures, his debut album, later that year, selling over one million copies in the US and launching four top twenty singles (two of which went to number one). Paisley's success continued over the years, with all of each of his eleven subsequent albums achieving gold status or higher. He holds the record for the most consecutive number-one singles on the Billboard Hot Country Songs chart, with ten, and has charted thirty two top ten singles on the chart throughout his career, including eighteen number ones. To date, Paisley has three Grammy Awards, fourteen Academy of Country Music Awards, fourteen Country Music Association Awards, and two American Music Awards. His most recent release is Love and War (2017).